I apologize in advance for the less than 21st century high definition resolution we all take for granted at this point. This is a crop of an already grainy 400 ASA 110 film shot taken 30 years prior to this writing, in 1982. And even for 110 cameras, mine was a pretty sorry specimen. Just about any type of street lighting, be it pole or lamp, had their single and twin masted version in New York City. The mercury vapor fluorescent Westinghouse Whiteway, hailing from the mid late 1950s, were no exception. The vast majority of Manhattan's Whiteway fixtures were bachelors, or bachelorettes if you like. They stood sentinel along the curbs of 3rd and 9th Avenues, after those north south thoroughfares were liberated from the dark shadows of their respective elevated train structures. 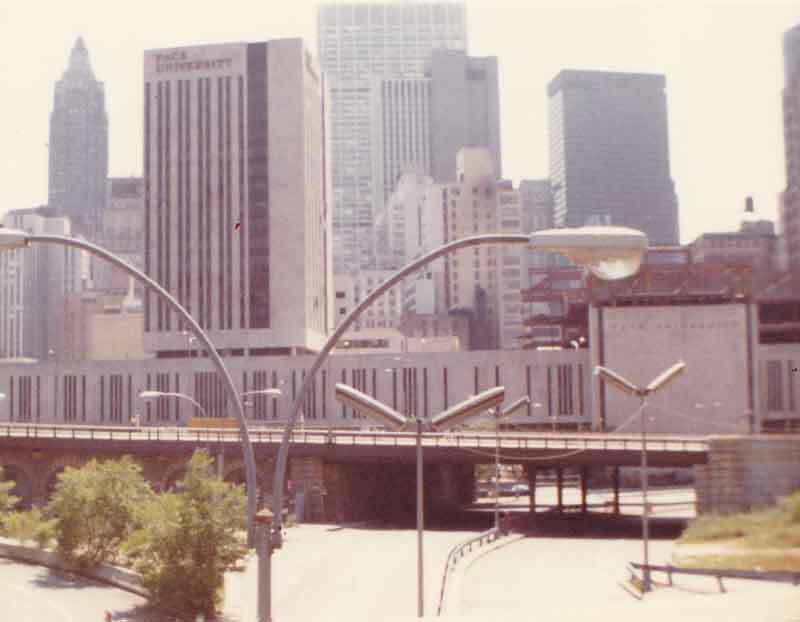 Further south, however, after 3rd Avenue's route passed through the Bowery into Park Row, between the Brooklyn Bridge touchdown point and City Hall, the Whiteway fixtures got the chance to show off their marital skills. As Park Row was divided by a center median, Whiteway couples were planted there. If married life is considered to provide better longevity than staying single, the Whiteway twin lamp poles might serve as empirical evidence, since the Park Row twins outlasted their uptown single relatives by many years. Sadly, not long after I shot a couple of photos of them, they too disappeared, victims of the relentless push at the time to install sodium vapor lighting across the city. Had I known their likely fate at that moment, I would have taken better care to get more detailed photos and close ups, but at the time I was actually hunting for cast iron relics, and shot these as an afterthought. 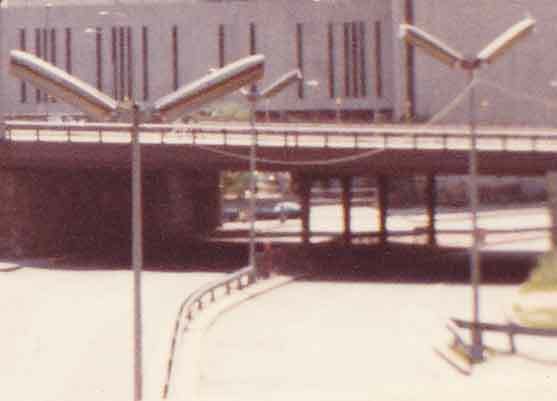 The wider scene from which the crop was taken displays the two types of lamp post and luminnaire combinations that edged the Whiteways out of existence in the 1970s, both the Donald Deskey designed aluminum shafted poles, and the plain Jane steel standards topped with the loopy uplift mast arms popularized by the stock street footage shown on many Kojak TV episodes.